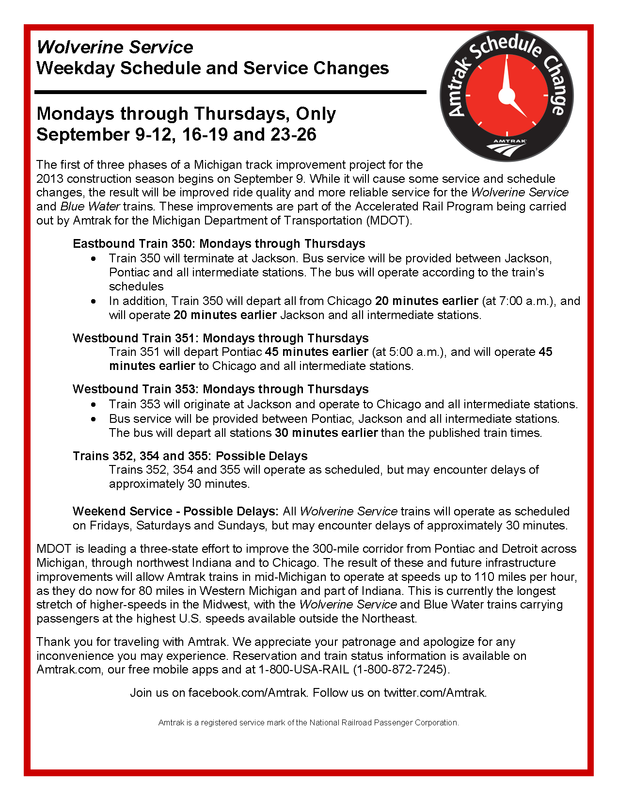 CHICAGO and LANSING — The first of three Michigan track improvement phases for the 2013 construction season begins on Sept. 9. While the projects will cause some delays and modified schedules, the result will be upgraded tracks and more reliable service for Amtrak Wolverine Service trains as part of the Accelerated Rail Program being carried out by Amtrak for the Michigan Department of Transportation (MDOT). This phase of the project will largely take place east of Jackson Mondays through Thursdays of the coming weeks, with the tracks open for all trains on regular schedules on Fridays, Saturdays and Sundays. The attached Passenger Service Notice will be distributed on trains and at stations to explain the Monday-Thursday schedule changes and provide more information about possible delays. Under a new Amtrak system, passengers can opt in when they make their round-trip or one-way reservations to be automatically notified when their trains are behind schedule due to construction work or for any other reason. When all 2013 phases of the project are complete in November, more than 30 miles of new track and 130,000 new crossties will be installed by crews working ten-hour days. MDOT is leading a three-state effort to improve the 300-mile corridor from Pontiac and Detroit across Michigan, through northwest Indiana and to Chicago. The result of these and future infrastructure improvements will allow Amtrak trains in mid-Michigan to operate at speeds up to 110 miles per hour, as they do now for 80 miles in southwestern Michigan and part of Indiana. This is currently the longest stretch of higher-speeds in the Midwest, with the Wolverine and Amtrak Blue Water trains carrying passengers at the highest U.S. speeds available outside the Northeast. A goal of the project is to reduce the end-to-end travel time between Detroit/Pontiac and Chicago by approximately two hours from the current 6 hours and 30 minutes. A series of public meetings are set this month to advance the plans. For more information, visit GreatLakesRail.org.